Mummy's Monday Manners: Do you know the regal way to hold a dessert fork and spoon? Do you know the regal way to hold a dessert fork and spoon? The dessert fork is facing to the right, and above, the dessert spoon is facing to the left. Notice how the ends of both are not equally aligned with one another but ever so slightly pulled to the right and left. When attending an informal dinner, if you observe that the place setting includes a dessert fork and spoon placed together, centered on top of the dinner plate, the good news is that you are definitely going to be served dessert, or "pudding" as it is lovingly referred to in England! The quandary for some is knowing which one to pick up. The simple answer is that you pick up both! Once dessert is served and you see the hostess has picked up her fork and spoon, then you follow suit by placing the fork in your left hand, tines side down, and placing the spoon in your right hand. The fork is used as a kind of "pusher" to place the dessert into the spoon, and then you eat from the spoon. Most guests choose to pick up either the fork or the spoon, instead of picking them both up together, one in each hand. So, now you know! When you set an informal place setting with the fork and spoon above the dinner plate, remember that the fork is on the bottom, with the tines facing to the right. It is easy to remember that the fork is positioned to the right, so that the tines cannot poke your heart! The spoon is placed higher, above the fork, with the bowl of the spoon facing towards the left. A spoon full of sugar cannot hurt your heart! I was delighted to learn a little nuance when doing a photo shoot for my book, The Pretty & Proper Living Room. I arranged a composition for "a romantic dinner for two" on a Pembroke table in my living room at Fox Hall. Just before the photographer began to shoot the scene, my dear friend, a consummate British gentleman, popped in to say hello. He glanced at my place setting and asked permission to suggest a slight adjustment. "Yes, of course! I relish your seasoned insight!" So, he gently moved the dessert fork and spoon, infinitesimally, to the right and to the left. "This enables your guest to pick up the spoon without the possibility of the fork pricking the right hand,” he explained. A tiny but refined detail! 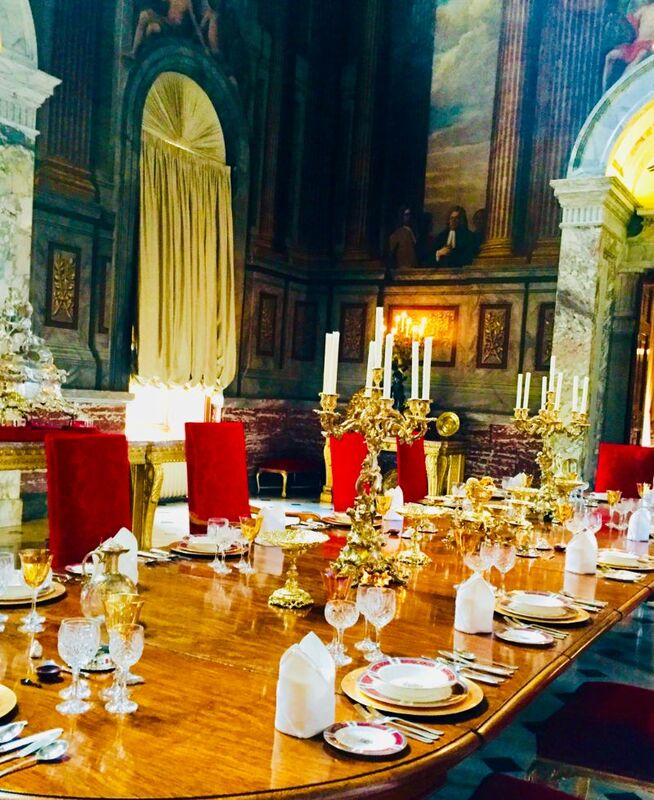 A place setting in the stupendously handsome state dining room at Blenheim Palace in Oxfordshire, England. I filmed an episode for my public television series, You Are Cordially Invited, with Lady Henrietta Spencer-Churchill, the eldest daughter of the 11th Duke of Marlborough, in the private apartments. They had never before been filmed. 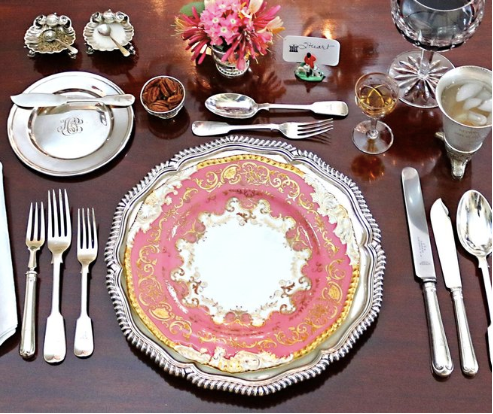 For a formal place setting, the dessert spoon and fork are not placed above the dinner plate! Instead, they are in line with the rest of the flatware. The dessert spoon is placed closest to the plate on the right, and the dessert fork, just to the left of the plate so that they are the last pieces of flatware employed while dining. This will allow you to savour your pudding! Rarely do you see the dessert fork and spoon placed above the plate in regal residences in England. 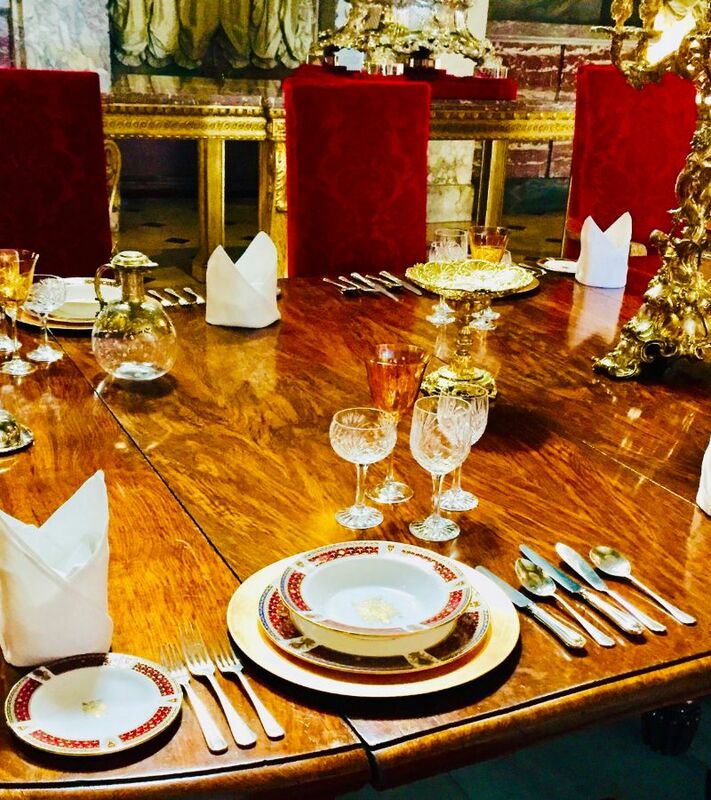 Here, in the state dining room at Blenheim Palace, notice how the dessert fork is directly next to the plate on the left. The dessert spoon, to the right of the plate, has a small knife between the plate and the spoon. This is for the last course being served, possibly cheese or fruit. To experience the exclusive private apartments at Blenheim Palace, as well as Highclere Castle, my DVD is available for purchase at the PBS online store here. You may already know this tip, but perhaps send it to your grown children, as a subtle reminder from Holly (and her Mummy) — and not from you! You are invited to sign up a friend or family member HERE to receive these newsletters too. Were you forwarded today's tip? Remember to sign up for weekly tips from Mummy HERE. 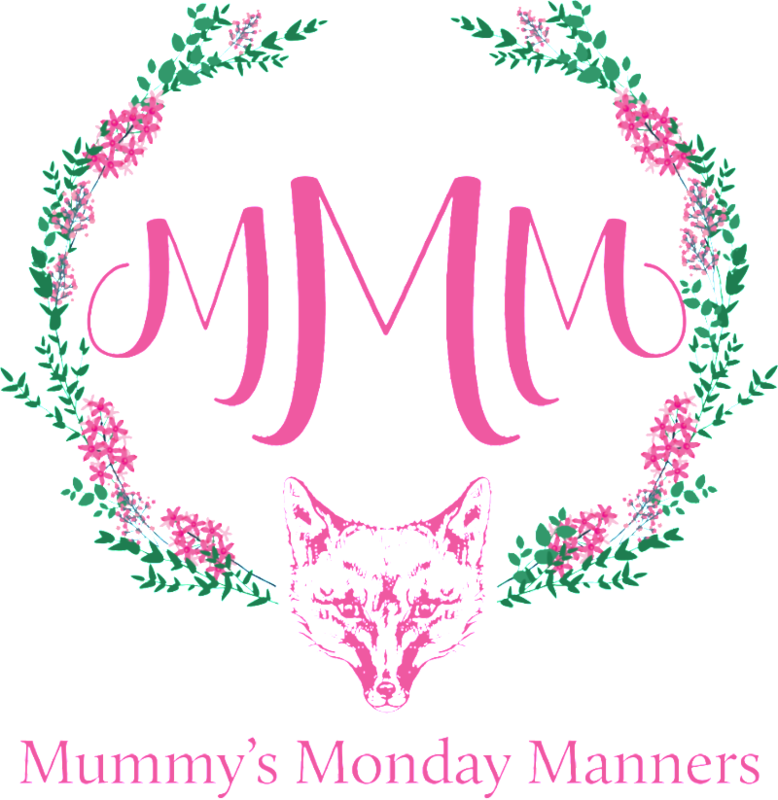 Read recent Mummy's Monday Manners email newsletters by going HERE. Holly Holden, LTD., All rights reserved.